There are many things that you can do with a basic pancake recipe to make it a little bit more exciting. 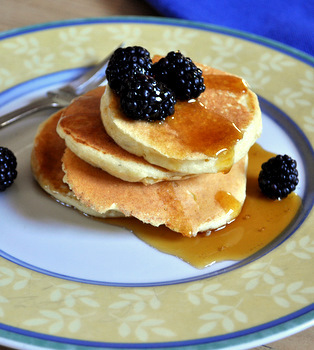 You can vary the syrup, using everything from maple syrup to agave to a thickened berry sauce. You can add fruit to the batter, or chocolate chips or even bacon. The options are almost endless, and one of my favorite things to add in is ricotta cheese. Ricotta cheese adds both lightness and richness to the pancakes, giving them a more tender texture and a slightly richer flavor than plain pancake batter. You can use any variety of ricotta cheese. Low fat and full fat tend to give the best results, but even a fat free ricotta will work well. But ricotta isn’t the only secret to these pancakes. The eggs are separated before going into the batter and the whites are beaten to soft peaks. This adds a lot of air and keeps the pancakes soft and fluffy. 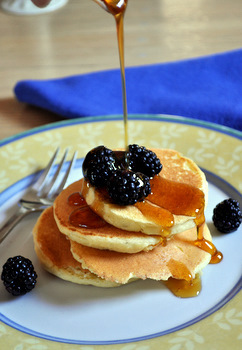 These pancakes are a great way to start the morning and are a nice change of pace from the usual buttermilk pancakes. The best way to serve them is with a little bit of browned butter and a splash (or three) of maple syrup. Fresh fruit also makes a nice finishing touch. In a small bowl, whisk together flour, baking powder and salt. In a large bowl, whisk together egg yolks, melted butter, vanilla extract, ricotta cheese and milk until smooth. Add in flour mixture and whisk until just combined and no streaks of dry ingredients remain. In a medium bowl, beat egg whites to soft peaks, beating in the sugar as the egg whites become foamy. Fold into ricotta mixture. Heat a griddle or skillet (nonstick or lightly greased) over medium-high heat until a drop of water placed on the surface skitters around (if it evaporates instantly, reduce heat slightly). Drop batter in 1/4 cup dollops and cook until golden on both sides, about 2 minutes per side. Serve immediately, with butter and maple syrup. Oooh. Fluffy ricotta pancakes. Yummy. I have to pass this recipe on to my mother-in-law. She asks everyone how they make their pancakes. It’s pretty hilarious. She’s like a pancake fanatic. Your cooking always amaze me. Its full of nutrient yet so delicious. 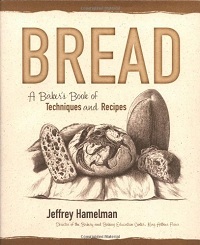 Thanks for posting good recipes. I cannot believe I’ve lived this long without having these magical pancakes. Do you believe I used to throw away leftover ricotta cheese, after making lasagna? Never again! Thanks for this simple & delicious recipe. Made these today! They were incredible! Thanks for sharing the recipe! This pancake is sO… gOod!!! 101%. Make this again for sure. :) thnx for sharing the recipe. These were good, but a bit eggy. I would use 3 eggs, not four. Also, this only served four very hungry college kids, so double the recipe if you’ve got famished guests. Found this recipe last night and was excited to get up this morning with the thought of yummy ricotta pancakes….half way through realised I had only ONE egg….fear not, luckily my brain (egged on by a promise to an eager and hungry four year old) was working early enough to use a mix of 1 x mashed banana and 4 tbsp of luxury ready-made vanilla custard instead of the other 3 eggs! Worked a treat. Hurrah we have pancakes!! Child and Mother happy as eggs. I’ve made these pancakes several times, and each time they are fantastic. I love the little bits of ricotta inside each pancake, keeping everything moist and delicious. I often add lemon extract or lemon juice instead of vanilla. Today (right now, actually) I’m making them with pineapple juice instead of the milk, with blueberries. I tried going back to buttermilk pancakes a few weeks ago, and I felt like an uncivilized savage. It’s like going from morphine to advil – no comparison. Fantastic job on this recipe!